The beaver is a mammal, measuring approximately 75 cm long and under 30 cm tall. Its tail is broad and flat and is used by the animal to swim. Its back feet are webbed and all digits are clawed. Its coat is generally brown-reddish on the back and paler on the belly. Its eyes are small and the nostrils can close. The incisors are very strong and yellow in colour, so the beaver can use them to fell and work the timber to make dams. 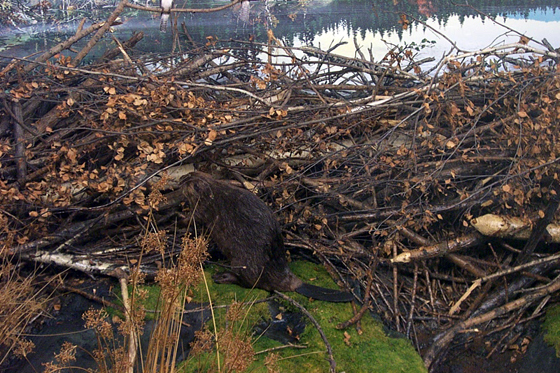 The stream barrages made by the beaver make up ponds, where the animal builds its den. The den is an island of vegetal materials. The island contains a central chamber, with the floor covered in bark and wooden splinters just above water level, and some secondary chambers used to store food.